How and Where to Buy Azilect? CanadianPharmacyWorld.com offers Azilect at the best price available online. We offer brand and generic medications with a valid prescription from your doctor. Our Canadian international pharmacy offers free shipping on all orders to the US. For more information and further assistance, please call Customer Service at 1866-485-7979 or email us. Are there Alternative Names for the Brand and Generic Azilect? The brand name Azilect comes from Turkey and Canada manufactured by Teva. The generic Rasagiline also called Rasalect comes from India and is manufactured by Sun Pharma. We also carry the generic from India called Relgin manufactured by Intas Pharm and the generic from UK manufactured by a different manufacturer. What Dosages and Forms is Azilect available in? What is Azilect used for? 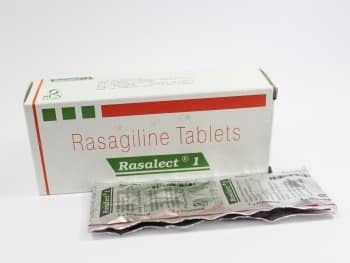 Azilect (Rasagiline) is a prescription medication that is used to treat the symptoms of Parkinson’s disease such as poor muscle control, spasms, stiffness and tremors. Rasagiline belongs to a class of drugs known as MAO inhibitors. Rasagiline works by increasing the levels of natural substances such as dopamine, norepinephrine, and serotonin in the brain. Parkinson's disease is thought to be caused by too little dopamine in the brain. Azilect may be taken alone or in combination with levodopa or a dopamine agonist such as ropinirole or pramipexole to treat the symptoms of Parkinson’s disease. What are the Possible Side Effects of Azilect? Are there any Precautions or Drug Interactions for Azilect? You should not take Azilect if you are allergic to Rasagiline or if you have any other allergies. Before you start taking this medication, talk to your doctor about your medical history and about all the medications you take including OTC and herbal medications. Azilect may make you dizzy or drowsy. You should not drive, use machinery or do any acitivity that requires you to be alert. Limit alcoholic beverages. People who take Rasagiline have fallen asleep without warning signs of sleepiness or drowsiness. This medication should not be used during pregnancy unless the benefits outweigh the risks. Talk to your doctor right away if you become pregnant while using this medication. Azilect can reduce the amount of milk produced by a breast-feeding mother. Talk to your doctor before breast-feeding a baby. Azilect should be stored at room temperature away from light and moisture and out of reach of children and pets. This medication should not be stored in the bathroom.